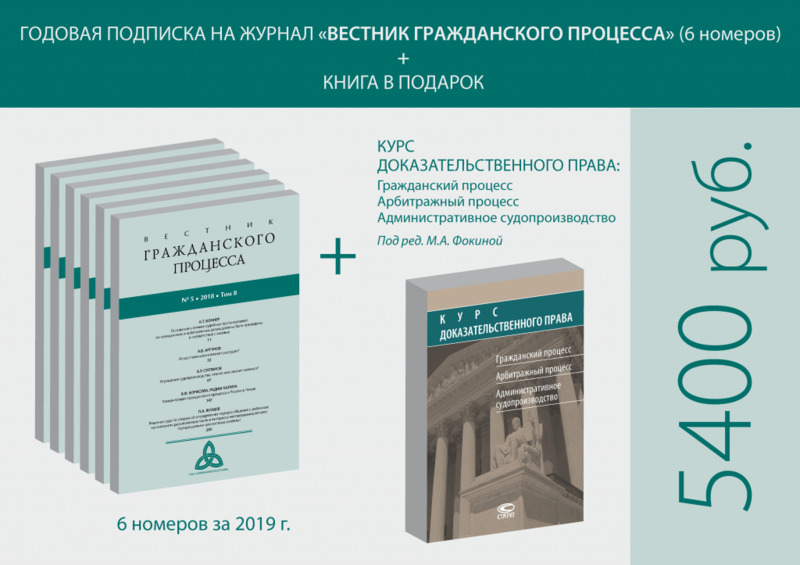 An annual subscription to the journal "Journal of Civil Procedure" (6 issues) in 2019 was opened. All annual subscribers will take a gift book "Course of evidence". Subscription price - 5400 rub. This course sets out and analyzes the scientific provisions of the theory of evidence and evidence in civil, arbitral proceedings, administrative proceedings, the rules of law governing the evidentiary activities of subjects of the civil process. The legal positions of the European Court of Human Rights, the Constitutional and Supreme Courts of the Russian Federation on the key issues of the law of evidence are outlined.